East Nashville Magnet played an integral part in bringing the Civil Rights movement to Middle Tennessee. East Nashville Magnet was built at the start of the New Deal in 1932 as part of a plan by Dr. Frank Bachman of George Peabody College. He recommended “three new white and one new black high schools” be built in the area. The striking art deco façade is marked by a clock over the central entrance. This was erected in 1946 as a memorial to the fifty-nine alumni of the school who died in World War II. The building is listed on the National Register of Historic Places. The school is most notable for the role it played in the Civil Rights movement. In 1955, the same year that Rosa Parks sparked the Montgomery Bus Boycott, a young African-American student named Robert Kelley, Jr. was denied entry to the school. Shortly thereafter, his parents alongside others filed a lawsuit against the Board. When they won their court case in 1956, the school board devised a plan to integrate using the so-called “Nashville Plan,” alternately known to history as the “grade-a-year-plan” wherein one grade every year would be integrated until the entire school system had been integrated. White residents, though, militantly opposed integration. Surprisingly, it was a recent immigrant to the South, a New Jersey segregationist named John Kasper, who whipped up anti-integration sentiment among whites. Kasper was a major figure during the struggle to integrate the Nashville schools, and he was later arrested in connection to a school bombing in Clinton, TN. As historian Don Doyle has stated, the grade-a-year-plan was understood as “a deliberate program of gradual and token desegregation formulated by people who had no enthusiasm for integration." However Nashville’s plan differed from other southern places like Virginia where officials resisted integration laws altogether. Today, East Nashville Magnet students are predominately African American and take exclusively honors and AP classes here in college preparatory programs. East Nashville High School, Nashville, Tennessee, n.d.: An exterior view of East Nashville High School, located at 110 Gallatin Road, in Nashville, Tennessee. The school was first opened to 1500 students in grades 9-12 in the Fall of 1932, in the midst of the “Great Depression.” Forms part of the Metro Archives Photographs - School Collection. 1 photograph. 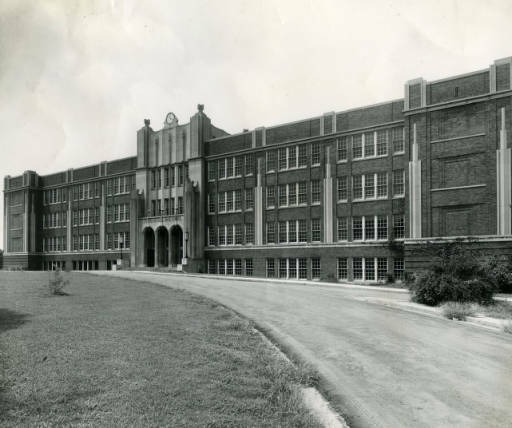 ~ Source: Metropolitan Nashville/Davidson County Archives, Nashville Public Library ~ Date: n.d.
Wes Dunbar, “East Nashville Magnet High School,” Bygone Nashville, accessed April 25, 2019, https://bygone-nashville.mtsu.edu/items/show/48. The role played by East Nashville Magnet in the Civil Rights movement. Doyle, Don. Nashville Since the 1920’s. Knoxville: University of Tennessee Press, 1985.